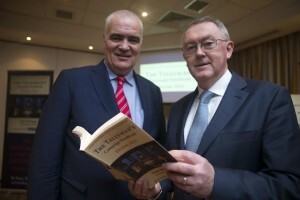 As anticipation mounts for the announcement of the general election, “The Tallyman’s Campaign Handbook- Election 2016″ by leading political pundit and psephologist Noel Whelan with Kathryn Marsh, was launched in Dublin, steps away from the Leinster House seat of power. For the fourth election in a row, Whelan and other leading electoral commentators have created a uniquely detailed guide to the national political landscape; key policy issues and the concerns which will dominate the election debate. The book also explores the likely campaign strategies of each of the parties and examines how new gender quotas, campaign finance regulations, postering restrictions, turnout, and the impact of social media will shape the campaign environment. The book details all 40 battlegrounds at the outset of the campaign. Constituency by constituency, it assesses the performance of the parties and independents over the last five years and their likely performance in the 2016 election. The handbook also explores the key local issues which may determine fates when voters go to the polls.